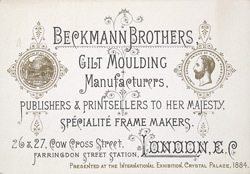 This is an advertisement for Beckmann Brothers gilt moulding service. During the late 19th century it was very fashionable for gilding to be applied lavishly to many different decorative objects such as picture frames, china, vases and candlesticks. Popular colours were gold, yellow, green and dark blue. Patterns for gilding were often taken from Chinese designs or gothic ideas but it was flower designs that were the most sought after. The Beckman Brothers specialised in gilding for picture frames and as featured on the leaflet, even supplied Queen Victoria with items.